Las Vegas City Councilman Bob Beers rubs his head during a City Council candidate forum Tuesday, March 14, 2017 at Temple Sinai, 9001 Hillpointe Road. Photo by Jeff Scheid. An annoyed citizen called Las Vegas City Councilman Stavros Anthony’s office several weeks ago and requested he take down his campaign signs, grousing that the election happened in November. Las Vegas City Councilman Councilman Stavros Anthony speaks during candidate forum Tuesday, March 14, 2017 at Temple Sinai in Summerlin. Photo by Jeff Scheid. Indeed, campaign season in the Las Vegas Valley picked up again before President Donald Trump even entered the executive office in late January. And, soon, campaign paraphernalia sprouted once more across the region. Gone were the signs stumping congressional or presidential candidates, replaced by new ones touting people vying for local government seats. 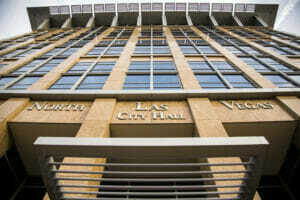 Three municipalities — Las Vegas, Henderson and North Las Vegas — hold elections this spring for various posts. In Las Vegas, council seats in Wards 2, 4 and 6 are up for grabs as well as two municipal court judge positions. 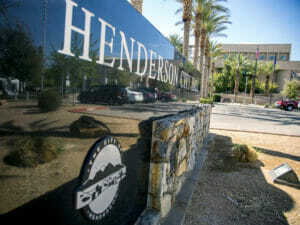 In Henderson, voters will choose a new mayor and a Ward 3 council member. Meanwhile, North Las Vegas residents will decide whether to keep Mayor John Lee in office and who should represent them in Wards 1 and 3. Early voting for the primary election, which is April 4, began Saturday. If a candidate receives a majority of votes in any race, he or she is declared the winner, rendering a general election unnecessary. If not, the two candidates in each race who garner the most votes move on to the general election in June. The odd-year elections often draw tepid participation despite the magnitude these positions can have on residents’ everyday lives. City council members, for instance, are the elected officials who can find ways to fix potholes, repair street lights, remove bothersome graffiti and catch stray animals wandering local roads. They also make decisions regarding land use and development, which can shape the future of neighborhoods. And yet, in the 2015 municipal primary elections, turnout among registered voters was 15.7 percent in Las Vegas, 11.8 percent in Henderson and 9.4 percent in North Las Vegas. Lackluster voter turnout doesn’t mean these races are any less interesting, though. This year’s round-up includes a host of colorful storylines: An outspoken former state assemblywoman hoping to nab a Las Vegas city council seat. A development proposal near a gated community taking center stage in one council race. And a “cowboy” former county commissioner hoping to re-enter local politics in North Las Vegas. As the clock inches closer to Primary Day, they’re kicking their campaigns into high gear. In these elections, small shifts in votes can change the outcome. If the elections don’t go well for three Las Vegas incumbents, the City Council could have a whole new look and feel to it soon. Councilmen Stavros Anthony (Ward 4) and Bob Beers (Ward 2) are seeking re-election. Mayor Pro Tem Steve Ross, who represents Ward 6, can’t run again because of term limits, but his wife, Kelli, hopes to keep a Ross in that position. She’s running for the Ward 6 council seat along with nine other people, including former state Assemblywoman Michele Fiore and Clark County School Board Trustee Chris Garvey. 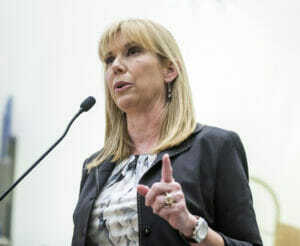 Fiore’s entrance into the race — she announced her intention to run in late December — added a level of intrigue. The say-anything Republican, who’s an ardent supporter of President Donald Trump, is no stranger to headlines. She flew to Oregon to support the Bundy family’s cause during the armed standoff at a wildlife refuge last year and previously released a calendar filled with photos of her clutching firearms. The Brooklyn native and daughter of a lesbian eschews political correctness in favor of candor. Photo courtesy of Michele Fiore. “I’m not going to change that,” she said, adding that her bluntness would be a “breath of fresh air” on the city council. She also doesn’t offer any apologies for pitching her conservative values as she campaigns for the nonpartisan council seat representing the city’s northwest side. Fiore said politics is partisan, and she believes that her Republican party affiliation will aid her well among potential voters in Ward 6. If elected, though, Fiore said she would “rule nonpartisan” with an open-door policy extended to constituents of all party affiliations. Fiore has won over the support of two key unions, Laborers Local 872 and Las Vegas Firefighters Local 1285. Tommy White, secretary-treasurer of the laborers’ union, lives in the same gated neighborhood as Steve and Kelli Ross, but he has a Fiore campaign sign planted in his front yard. “Two Rosses don’t make a right,” he said. White said Fiore has backed construction projects, such as the proposed NFL stadium, and has appeared to “calm down a bit” since her days in the Assembly. The union supports her “110 percent” and thinks she’s the best person to address concerns in Ward 6, he said. “I really believe she’s going to be the strongest person out there to fight crime, watch how the new region is growing,” he said. Even so, Kelli Ross maintains the fundraising edge over Fiore and Garvey. Kelli Ross, who declared her candidacy last fall, raised $130,050 in 2016 and $72,955 in the first quarter of this year, according to campaign finance reports. Meanwhile, Fiore raked in $110,337 during the first quarter of this year. Garvey raised $54,746 over the course of last year and the beginning of 2017. Las Vegas City Hall as seen on Thursday, March, 16, 2017. Photo by Jeff Scheid. Kelli Ross, a registered Democrat, said she’s not scared about going up against Fiore’s brand of politics. Now an Allegiant Air employee, Kelli Ross previously owned an electrical contracting business, which she said fell victim to the recession. This would be her first time holding an elected office. She ran for state senate in 2012 but lost to Republican Scott Hammond. She bristles at the notion that she’s simply a legacy candidate trying to keep the family name in local politics. 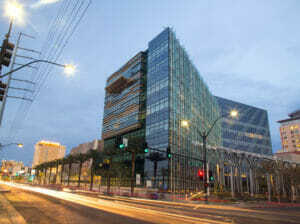 A contentious development project could decide the Ward 2 race in the Summerlin area. The seemingly never-ending battle over the fate of the shuttered Badlands Golf Club, nestled among the high-end Queensridge neighborhood, has spawned lawsuits and many lengthy City Council meetings. It boils down to this: EHB Companies owns the golf course and has proposed residential development on the land, which nearby residents vehemently oppose. Last month, the City Council voted 4-3 to allow several hundred condominiums on one edge of the property. Incumbent Bob Beers voted in favor of the plan and has argued that preventing development could put the city in jeopardy of “inverse condemnation” — a situation in which a property owner sues a government for just compensation of any seized land. He’s also hopeful an alternative plan with housing on 3- to 5-acre parcels could resurface at some point and replace higher-density plans. “I think people at the city hope an accord can be reached and that the alternative plan may yet be placed on the table for approval,” he said. Roush, whose background is in commercial real estate, and Seroka, an Air Force veteran, blasted Beers over the development issue at a recent candidate forum. “What Mr. Beers is doing is trying to hide behind a technicality,” Roush said in an interview this week. 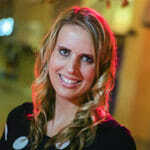 She does not believe the city would face an inverse condemnation threat and opposes any development on the course. Roush does not live in the Queensridge neighborhood. Even so, Roush said the development battle is far from the only issue she would tackle in office. She wants to enhance safety in Ward 2, which she said is prone to burglaries, and make greater strides toward developing downtown Las Vegas. But her campaign estimates that Queensridge contains roughly 1,800 voters, meaning that voter bloc could sway the election’s outcome. Christina Roush, a candidate for Las Vegas City Council Ward 2, speaks during a candidate forum Tuesday, March 14, 2017 at Temple Sinai in Summerlin. Photo by Jeff Scheid. During the 2013 primary election, a total of 3,897 people cast a ballot in the Ward 2 council race. Voters first elected Beers into the Ward 2 seat during a special election in March 2012. He has remained the ward’s representative since then but downplayed any anxieties about what the future may hold. Instead, Beers pointed to his accessibility as a councilman, a signature element of his tenure that he said would continue if elected again. 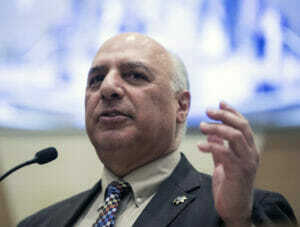 In the Ward 4 race, incumbent Stavros Anthony is seeking a third term. He’s running against three other candidates — Jon Edge, Deborah Harris and Sean Lyttle. It’s the end of an era in Henderson. The suburb’s two-term mayor, Andy Hafen, who started as a city councilman in 1987, cannot seek re-election. Seven candidates have thrown their names in the ring for that position, including Councilwoman Debra March and city employee Rick Workman, who ran against Hafen in 2013 but lost. In January, Workman challenged whether March is eligible to run for mayor, but the secretary of state determined she is not term-limited and, thus, can seek the mayoral gig. Henderson City Hall as seen on Thursday, March, 16, 2017. Photo by Jeff Scheid. March is leading in terms of fundraising and endorsements. The councilwoman raised more than $487,000 last year and the first quarter of 2017, according to campaign expense reports. Workman has raised roughly $24,000 since the beginning of this year. Muelrath cited the Interstate-11 project and development potential near the Henderson Executive Airport as two critical areas of focus for any incoming mayor. The political action committee affiliated with the Henderson Chamber of Commerce supports March for mayor, Muelrath said. Unlike Henderson, North Las Vegas likely won’t see a changing of the guard at the city’s top leadership position. Mayor John Lee, who is seeking his second term, is expected to beat his relatively unknown opponents, Gary Bouchard and DeQuincy “Quincy” Taylor. The more heated North Las Vegas race could be in Ward 3, where incumbent Anita Wood faces four challengers for her city council seat. Among them: former state lawmaker and Clark County Commissioner Tom Collins. Known as the “cowboy commissioner,” Collins abruptly resigned from his county elected position in August 2015, citing family matters. Then he floated his name out as a possible challenger against Lee in the mayoral race. After helping his aging parents with their living situations, Collins said he’s back and ready to re-enter local politics — but as a city council member, not a mayor. North Las Vegas City Hall as seen on Thursday, March, 16, 2017. Photo by Jeff Scheid. Collins said he’d like to see North Las Vegas attract more manufacturing-related businesses to land near the city’s core and add more hotel rooms, which could boost tax revenue. Ward 3 covers the northwest section of North Las Vegas. Since 2009, Wood has served as the ward’s council member. Voters elected her again in 2013, so she’s seeking her third term in this election. Councilman Isaac Barron is seeking re-election in Ward 1, which straddles Interstate 15. He has one opponent, Hector Rivera.